A Police Stockade during Tunnel of Death in Grand Theft Auto IV. 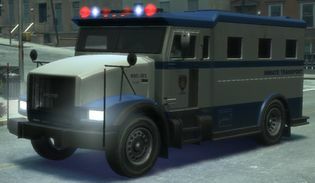 The Brute Police Stockade (also known as an LCPD Stockade) is an inmate transport for the police in Grand Theft Auto IV. The Stockade shares its body design with the Securicar, and is equipped with a light bar and siren, which, oddly, flash red and blue, against LCPD code, as Police Cruisers and Patrols carry red and white lights, just like NYPD code; the Stockade is also distinguishable by its custom LCPD inmate transport livery and additional windows. In addition, as with most police vehicles, the player can access the police computer from the Stockade. The Stockade's acceleration, top speed, and handling are otherwise identical to those of the Securicar. The Stockade makes two prominent appearances in GTA IV: first, in the mission "Tunnel of Death", where it is being used to transport Aiden O'Malley from the Varsity Heights Police Department to Alderney State Correctional Facility, and second, in the mission "Three Leaf Clover", where it used to transport NOOSE Agents to the Bank of Liberty. If the player has stored one in a parking space, sometimes a cop will target a predestrian and the ped will get in the back of the Van and a cop will get in the front and drive off. Police Stockades can spawn around the prison in Alderney, although this is a rare occurrence. The Stockade can be stolen and taken to a safehouse in the mission in "Tunnel of Death", but cannot be readily stolen in "Three Leaf Clover" — the player must push the Stockade to a safehouse with another vehicle if they wish to acquire it via this mission. The Stockade can also be seen during GTA IV's multiplayer "Team Mafiya Work" mode, when Kenny Petrovic tasks the players with killing Sergey — Sergey is being transported in a Police Stockade, which can be obtained by killing the driver through the side window, or by damaging it enough to force its occupants out. This page was last modified on 4 July 2012, at 15:18.